LaserTouch is now offering Thermage treatments in White Plains NY, a non-invasive radiofrequency therapy that can address the look and feel of aging skin on many areas of the body. Thermage® is a non-invasive radiofrequency therapy that can address the look and feel of aging skin on many areas of the body. 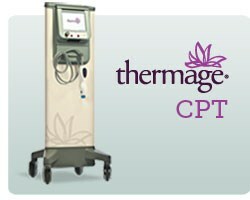 Thermage treatments are customized to the patients' needs, and typically require minimal recovery time. Solta Medical indicates that Thermage® helps reduce the visible signs of aging in just one treatment. Thermage® radiofrequency treatments go deeper than surface treatments, targeting the “source of the sag” in the dermis and subcutaneous tissue under the skin. The Thermage® deep heating energy helps strengthen the collagen in loose, sagging skin, giving patients’ skin a smoother, healthier look and feel. LaserTouch Aesthetics centers provide laser hair removal, tattoo removal, Botox® and fillers, laser skin rejuvenation, microdermabrasion, cellulite treatment, acne reduction and acne scar reduction, mole removal, smartlipo and other aesthetic procedures for female and male candidates of all skin complexions. LaserTouch Aesthetics utilizes the most advanced and safest laser and aesthetics technologies such as Elite MPX, Medlite C6 and Smartlipo MPX by Cynosure, GentleLASE® and GentleYAG® by Candela, Xeo by Cutera®, Fraxel® and Thermage by Solta, and Reaction, Trios and Pristine by Viora. LaserTouch serves New York City via two clinics, at 150 Spring Street in SoHo and 57 West 57th Street, Suite 809 in Midtown, serves Westchester New York via its 16 Church Street, White Plains location, and serves Long Island via its Garden City location at 100 Garden City Plaza, Suite 105, Garden City, NY 11530. For more information, visit lasertouchsoho.com or call 212-219-1990 for a complimentary consultation. To follow the latest in aesthetics, visit lasertouchsoho.com/blog.